I really love doing live demo's and speaking. I was asked to do a 2 hour presentation at CG Con this year on my work on Terminator. I also spoke about the renessiance modeling has gone through over the last 5 years. 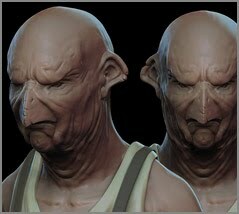 I did this as an example of how you can in fact use sculpting applications to do organic as well as hard surface within your sculpting application.